You'll be £4.99 closer to your next £10.00 credit when you purchase Falaise. What's this? 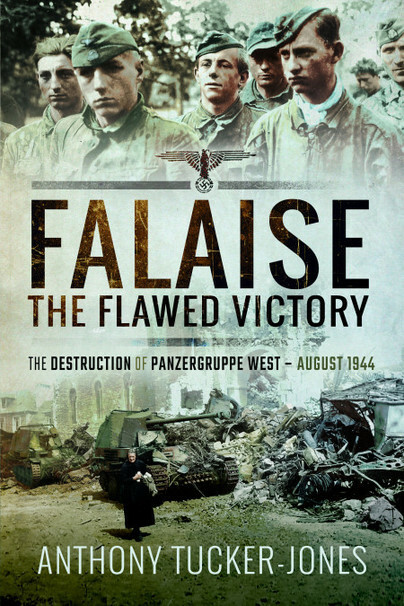 The destruction of the trapped German forces in the Falaise pocket in August 1944 is one of the most famous episodes of the Normandy campaign. But myths have grown up around accounts of the battle, and its impact on the course of the war is sometimes misunderstood. In this meticulously researched and perceptive study Anthony Tucker-Jones dispels misconceptions about the battle, describes the combat in graphic detail and reassesses the outcome in the context of the campaign to liberate Europe. He takes a broad view of the sequence of operations that culminated in the battle at Falaise, tracing the course of the campaign mainly from the panzers’ viewpoint. For two bloody months the panzers held the Allies at bay following the D-Day landings, but then they were blocked in at Falaise and the area became a killing ground. Some liken the event to Hitler's defeat at Stalingrad, while others argue the victory was flawed because so many German troops escaped.. I found this book very enlightening about the German perspective of the Normandy campaign. Many authors have examined the American, British and Canadian aspects, but I have found few books looking at the other side. It highlighted for me the fear that Allied air power generated amongst German commanders and soldiers, yet the actual number of German tanks destroyed by air power was relatively small. A more significant problem was the lack of fuel at the front line, and the breakdowns suffered by the German tanks. Again, the claims and counter claims about the number of tanks destroyed leads one to be sceptical about the numbers quoted by various authors, and to question the definition of ‘destroyed’... In conclusion, my view is that this book is a valuable asset to anyone having an interest in German armoured formations in the West, and the Normandy campaign in particular. The book makes for a good read and puts the performance of the German units not just into the story of the battle for Normandy, but in the wider context of the longer campaign in North West Europe. ​Read the complete review online here. You should seriously consider purchasing this if you want a better picture from the German viewpoint.